Dear Student As Per Syllabus of University of Health Sciences Lahore MDCAT Sllybus of English Vocabulary is changed. Here is complete vocabulary word of MDCAT. Plus point this MDCAT Vocabulary file it contains Urdu meaning. You can prepare your vocabulary portion via this mnemonics and meaning. If you need any kind of help drop your comment we will help you as soon as possible. 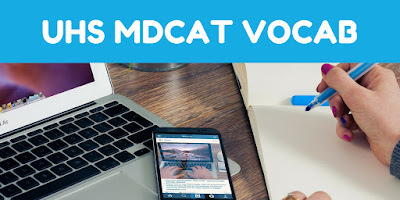 Dear students if you need any help about mDCAT drop your comment below. Click on download button to get a complete vocabulary. MDCAT Vocubalry Complete with urdu meanings. it will help students in mdcat hec hat test as well as nums prepration.